Having seen the results of about half a dozen box breaks since yesterday, it appears as if the hits are real hit and miss. The overwhelming majority of people weighing in on the Wax Report, appear to be bashing it. Collectors, at least initially are singing a different tune, driven primarily by player collectors chasing their respective favorite. A small sampling shows some cards selling for 50% or more of the box price. 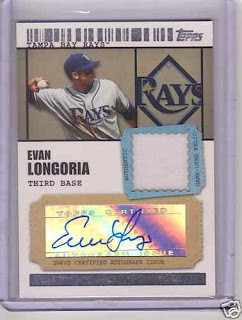 For example 3 different Evan Longoria relic autographs sold today for between $55-$61. Not a bad pull. 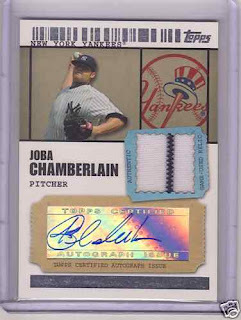 A pair of Joba Chamberlain relic autos sold for between $40 and $46. The real question is once the weekend is over and the initial rush to buy the newest release is over, will these cards maintain these prices? Time will tell. 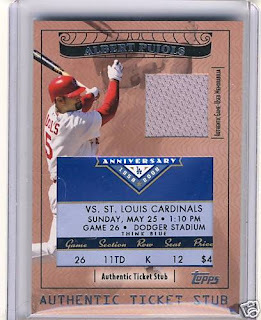 Personally, I think the design is a bit of a hatchet job with the ticket stub relics in particular. Anything that interfere with the player image means, USE A DIFFERENT IMAGE OR DESIGN. The other thing that people are weighing in on is the randomness of the tickets used. Collectors know a themed design is crucial to a successful product, and the game date needs to correspond with the card back and ideally be a game of particular significance to the player or team. I will reserve final judgement for a little bit still. You can see active listings here and completed listings here.